Literally the best rug I have ever owned. We have now had it in three different houses, and it always ends up prominently displayed. Comfortable, durable, and classy. 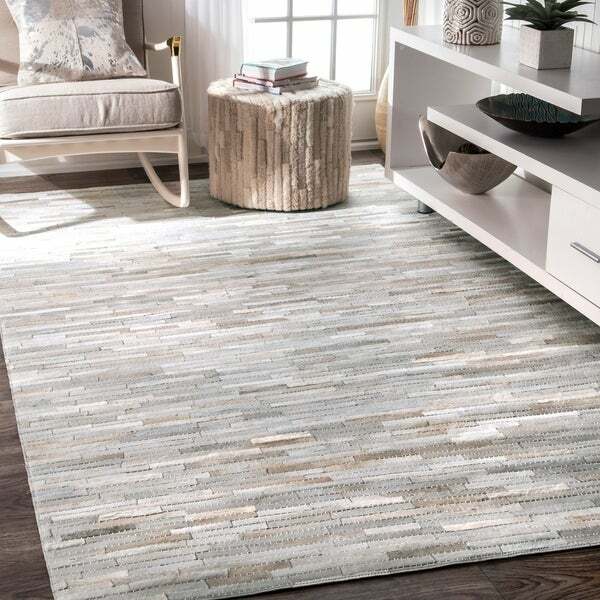 Featuring a stitched strip pattern, this Edith area rug from Carbon Loft will lend a dash of contemporary style to your living area. The high traffic rug is handmade from cowhide and leather backing. The chic design is rendered in natural, brown, off-white, and grey colors to complete the style of your space. Dimensions 72.0 In. X 7.0 In. X 7.0 In. Option: Beige - 7' 6" x 9' 6"
Looked at so many types of these rugs in person and wanted one so bad but couldn’t justify the price until I saw this one online. I took a chance that it may not be the best quality but this rug is so beautiful and well made. I’ve had it over a year now and no wear and tear anywhere. I get so many complements on this rug. We absolutely love the rug. The subtle colors of the hide create a beautiful accent in our living room. This rug is absolutely gorgeous! We have this in our living room and we get so many compliments on it. The colors are absolutely gorgeous and look great in our open concept home! great rug, soft toned colors and well made. It looks rich and more expensive that it was! Cleans up easily and looks great in my living room. Sheds more than my hybrid dogs. Orherwuse love it! Gotten lots of compliments and my four legged kids love laying on it. This rug is absolutely gorgeous. It is a perfect fit for its intended space. It arrived on time and was packed well. I expected it to have some kind of smell being leather but was pleasantly surprised that there was no little to none when opened. The reviews are are spot-on: this rug is beautiful, and looks far more expensive in a room than it actually was. Luxurious and silky-feeling on bare feet. I truly could not be more pleased with it. Looks great. very upscale, modern, and high end. best price on the web for this rug. Was delivered quickly and was as expected. It fit the space perfectly and we are enjoying it. Maintenance is somewhat scary as we do not vacuum it. Good quality.slightly thinner grids than I thought. I get compliments on this rug from friends and clients alike. It's gorgeous and feels great on bare feet. Everything I wished for and more. Great quality and soft on the feet! Thank you! "When will you expect to get these rugs in Thanks, Wendy"
"is this real cowhide or synthetic? for durability sake - would it be ok to use in a living room/den?" The rug is 100% real leather cowhide. "what does the warranty cover through overstock?" Clicking on the 5 year warranty will explain what is covered. "hi i just bought this rug...is there any stain proof treatment i can spray on it? I'm worried my dumb cat is going to barf on it! clearly not the best choice for me but i couldn't help myself is soooopn pretty! ;)"
thank u onesmartblond! my friend also mentioned how good natures miracle works on cowhide for such situations so i will get some. sorry for our grossness non animal people! Vacuum the rug weekly, vacuuming the underside, too, if possible. Professional cleaners should only use a dry extraction process, not steam or shampoo, on the rug. Blot spills immediately with a clean towel. Right size and goes perfectly in my dining room! Reviews were overwhelmingly positive and effusive about how soft this cow hide rug is. "The size on the dropdown is different than the size listed in the description. Can you tell me the size of this rug?" Hello laurenpearson17, we appreciate your inquiry. Our inventory changes frequently, and that will reflect on (the variable) what is available on the product page. The information on the drop down option is generally what is currently available. We hope you have found this information helpful. Thank you for shopping with us. Have great day!